After being burned out of the space in June 2015, New Masters Galley owner Bill Hill is celebrating the reopening of the gallery following extensive repairs and renovations. “It’s been really, really difficult, but we’re back home,” his assistant said. THIRTEEN MONTHS after a fire ripped through a Dolores Street art gallery and its upstairs apartments, the New Masters Gallery is back in business in its former home, and the second-floor spaces are all occupied again. Celebrations are planned for Friday and Saturday, July 8-9. “It’s been really, really difficult — we’ve had an extremely hard time, but we’re back home again,” said Heather Howe, who works for gallery owner Bill Hill. The cause of the June 6, 2015, fire remains a mystery, but Hill — who also lost much of his personal art collection, as well as irreplaceable family documents — is just glad to be back where he wants to be, in the building he remodeled and moved his gallery into in 1992. “We rushed down here, and the gallery was full of firemen and smoke,” he said this week, sitting in his newly rebuilt space, with its dark hardwood floors and warm but neutral colors. The fire had started near a back stairwell and was burning in the basement while firefighters and bystanders rushed to get as much artwork out of the building as possible. Paintings were handed outside to people who leaned them against buildings across the street, well out of the way of the fire and the water being used to fight it. “We were really lucky that the community stepped in to help us bring everything out of the gallery — everyone stepped up and went into the building and pulled out the artwork really quickly,” Howe said. 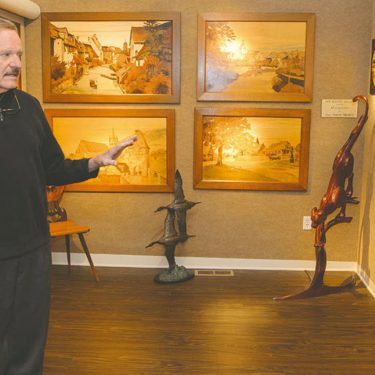 But much of the contents survived, and when an insurance adjuster helped inventory the gallery’s works, Hill said he was surprised to learn he had 1,900 pieces. “I couldn’t believe that, myself,” he admitted. While nearby gallery owners invited Hill to store artwork in their spaces that night, since all of a sudden, he had nowhere to put it, he later moved it all to a storage space in Monterey. He then hired a Hayward-based company to undertake the painstaking process of restoring them. “The restoration company picked it all up and took it up to their facility, and they still have 30 or 40 paintings,” he said. The process includes carefully cleaning the paintings and placing them in ozone chambers to help remove the smoke. The restoration efforts alone have cost about $320,000, which Hill said is being covered by insurance. And the destroyed artwork and other contents of the building, like computer equipment and furniture, totaled a little more than $300,000. Hill said the claims have yet to be settled. “Dealing with the insurance was the hardest part — I’ve become a fire insurance expert,” he commented. In an instance of good timing, although the computers were destroyed, the records they contained weren’t. As Hill contended with the fire’s aftermath, he also had to figure out what to do while the Dolores Street building, which is owned by Jody LeTowt, was being cleared out and rebuilt. “I was essentially out of business, which was frightening,” he said. But, having been around for a while, he knew many of the major downtown property owners and started asking if anyone had any temporary space. At first, no one could offer anything that was large enough, but less than two weeks later, Bob Leidig called and told him about a gallery space opening on Dolores on the north side of Ocean, just a couple of blocks away. “It was a real blessing,” Hill said. But he was even more thrilled to be able to start moving back to his usual gallery. “We moved all of the artwork in two days,” he said. To celebrate their “rising like a Phoenix from the ashes,” Hill and Howe are collaborating with the Carmel Chamber of Commerce on a ribbon cutting July 8 from 5 to 7 p.m., and are hosting a party Saturday, July 9, from 4 to 7 p.m., with food from local restaurants, wine from Cima Collina, and other activities. “I want to say, ‘Thank you,’ to all the community and everyone for their help,” Hill said.